For most entrepreneurs, landing one’s product in a big-box retailer is the ultimate goal. Erin Borges, an inventor and mom from Monterey Calif., did just that — and in under two years. Her product? A reinvention of the traditional gift bag. Her patented GoGo Gift Bags, which retail nationwide at Target, Bed Bath & Beyond and Cost Plus for between $ 2 and $ 5, have tissue paper built right into them — thus alleviating the customer’s need to purchase two separate products. When I came across Borges’s invention on Facebook, I was charmed and impressed. The stationery and novelty gift industry is extremely tough to break into. I remember submitting many of my own ideas to these kinds of companies, but never found them very inventor-friendly. So, when I came across Borges’s invention, I was curious to discover how she herself had secured a licensing deal with an industry leader, and in such short order. Here’s how she did it — and if you too are an inventor, how you can, too. 1.Focus on making a small improvement to an existing idea. In the fall of 2015, Borges was running late when she stopped at a big-box retailer to pick up a gift for a preschool birthday celebration. As a price-sensitive consumer, she was dismayed to discover that the bag and tissue paper she needed to enclose her gift cost nearly as much as the gift itself. Beyond that, she was unhappy with the final presentation. The tissue paper didn’t even conceal the gift. At the party, she noticed that most of the other gifts looked similarly lame. When she returned home, she set out to invent a better gift bag — one that would result in an attractive presentation, be more convenient, produce less waste, and work seamlessly. In short, she made a small improvement to an existing idea. What Borges keyed in on was what I like to describe as a “sleeping dinosaur.” Sleeping dinosaurs are products that have been selling for a long time but have remained relatively unchanged. In other words, they’re ripe for innovation. 2. Quickly create a rough prototype. With the leftover tissue paper, Borges began experimenting with different designs. A self-described lifelong tinkerer, she worked on iterations of folded tissue paper until she was satisfied that her prototype worked every time. She made a rough prototype using inexpensive materials at her disposal. 3. After studying the market, get expert intellectual property guidance. Borges knew she needed a strong legal representation, so she asked around for the name of a highly regarded firm. As she examined profiles of patent attorneys, she zeroed in on an attractive 30-something-year-old woman wearing a Tory Burch blouse. This is someone who will understand my product, Borges thought to herself. But when Borges called the firm to set up an appointment, she was told that it wasn’t interested in taking on unsolicited clients. Undeterred, she obtained the woman’s contact information on Google and reached out to her directly over social media. When the attorney agreed to meet with her for 15 minutes later that day, Borges hopped in her car and drove two hours to get there. “As soon as she saw my product, she reached for it across the table,” Borges told me. They ended up meeting for an hour. Two weeks later, the firm agreed to work with Borges. Borges was wise to recognize that she needed a patent attorney who understood her vision and the benefits of her invention. To that end, I highly encourage you to share your marketing materials with your attorney. 4. Hustle hard at the right trade show. To get to market and scale up quickly, Borges knew (from watching Shark Tank and doing other research) that she would need a powerful partner. Five months after she filed a non-provisional patent application, she showed her idea publicly for the first time at the National Stationery Show in New York City. Getting there was a struggle financially, but when the show offered her a payment plan for the cost of exhibiting her product, she made it happen. With the help of a friend and her husband, Borges used deconstructed gutter guards and egg cartons to build a unique, lightweight wall system she could ship to her hotel room. At the show, she stood at the edge of her booth near the walkway with a huge smile and energetically and continuously “bloomed” the gift bags she had prototyped herself. (Watch the GoGo Gift Bag bloom in action here.) Her hard work paid off: A day after the show, the global design powerhouse IG Design Group emailed her to invite her out to its corporate office in Atlanta. If you approach a trade show the right way — meaning, by making the most of it — this venue can be incredibly useful for securing a licensing deal. (Having your own booth is not a must and in most cases I don’t recommend getting one. If you do get a booth, have someone on your team walk around and create relationships with other companies. There’s no guarantee the right licensee will just walk by you.) From what Borges told me, her handmade booth was effectively eye-catching and popular from the start. 5.Continue establishing perceived ownership over your idea. After Borges secured interest from a potential licensee, she didn’t stop marketing herself and her invention. In June 2016, she submitted the GoGo Gift Bag to HSN’s American Dreams contest — and won the Customer Choice Award. She was subsequently published in three issues of Good Housekeeping magazine in 2017. After pitching the Today Show for more than a year, Borges woke up on a random Friday last month to discover that the Kathie Lee &Hoda show had reviewed her product. She’s continued to share her story widely, appearing on MSNBC’s Elevator Pitch and in local coverage. 6.Fight hard to ensure your product is a success story. The reality is that most products that make it to big-box retailers fail, a fact that entrepreneurs are all too aware of. On Facebook, I noticed a group of female entrepreneurs from around the United States rallying around Borges. The GoGo Gift Bag was set to roll out in Target and Bed Bath & Beyond nationwide for the holiday season, Borges told me. But when she followed up to check out how displays of her product looked in stores, she discovered some stores had yet to bring them out on the floor. 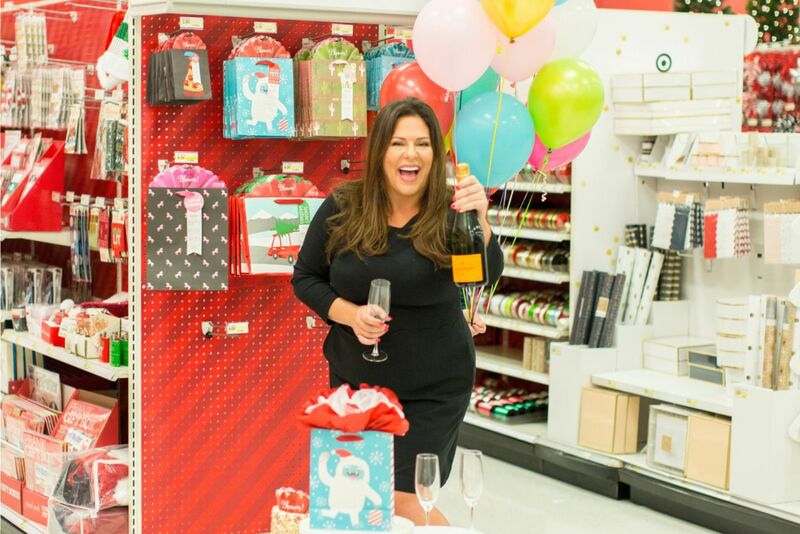 With the clock ticking on holiday shopping, her online friends (originally stemming from a private Facebook group of Shark Tank alumni) began supporting her by visiting their local retailers to purchase GoGo Gift Bags and request them from the back room using inventory codes. After tracking down the bags, many of these women decided to share Borges’s story with their friends and family on social media — further magnifying her reach. The point being: Products aren’t always displayed as they should be or at all. That’s why companies with the resources to do so continually have their staff go through brick and mortars to confirm that their product display looks good. It’s not enough to secure a deal and merely get to market. You can never just walk away and expect your product to do well. You have to stay with it and create demand. In today’s world, with social media, that’s easier than it’s been in the past. Entrepreneurs are defined by their tenacity. Whom you know and what you already have aren’t nearly as important as how you use your creativity to get where you want to be. Borges is an inspiring example of what can happen when you put in the time, trust your gut and don’t overthink it.